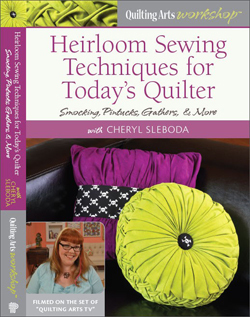 OK Quilter’s meeting – Cheryl Sleboda – Textiles. Technology. Texture. Teacher. The meeting showed the self-portrait idea was a big hit! Lots of tops were brought in. Now we just have to quilt them. We are supposed to continue work on this project and revisit the circles project idea. I want to start my thread play on the self-portrait, but not sure what I want to do with those circles just yet. I may start a second set of circles. Now, my round robin group is about to do the big unveiling. Our group, the Friday Lunch Bunch, as I call us, is doing a UFO round robin. Basically, you hand over an UnFinished Object from your stash, one you may never want to work on again. While I don’t have so many of these, I do have a few. I gave over a lime green and hot purple top that had these weird stack-n-whack hearts. I don’t know why I did the hearts, I don’t even like hearts. We meet every two months or so to exchange boxes and we don’t see what the final result is until everyone has taken a turn with your box. 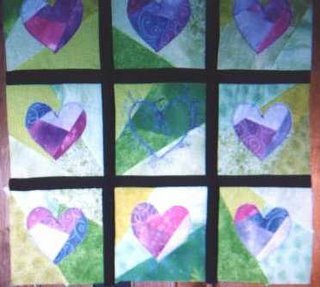 It’s been over a year since I have seen this quilt, so I have NO IDEA what it will look like when done. This horrible picture is all I have of the “before”. I’ll get it back the 26th, during a dinner for the final exchange. I’ll definitely post the results. The other side of this is the box I have to work on before the exchange. Like the last box, I’m quilting this one. I’m not confident of my machine quilting, despite the new machine I have. Again, I am traveling for work the weekend before the exchange, so I have to work on it now.